Security templates allow you to define different permission sets that use often, rather than manually adding all the security roles each time you edit security. Their object types (tags, person notes, pages, etc.) define these templates. 1. From the Administration menu, click the Security Templates option located under the SECURITY heading. 2. Click the Add New Security Template icon. 3. Enter the Name for this Security Template. 4. Enter a Description for this Security Template. 5. Select Object Type. Available objects include Portal, Page, Module (module), Tag, Attribute, Attribute Group, Metric, Report, Group Cluster, Application, Person Field, Person Note, Document Type, Assignment Type, Background Check Type, and API Application. 6. 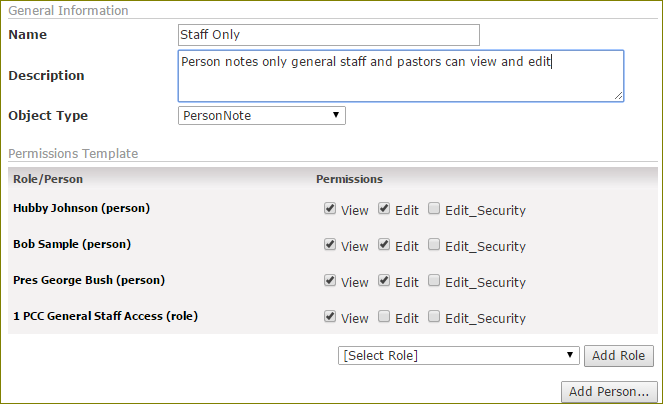 Select the Security Roles or add individual records to this Security Template. 8. Click the Update button. 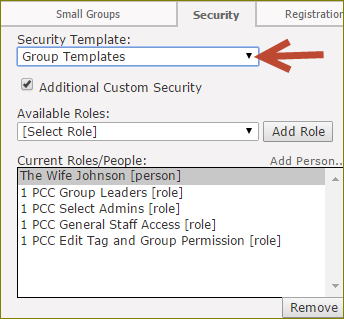 When applying a security template to additional objects such groups, tags and person fields, the security template is available in the security pop-up window.